Squamous cell carcinoma of the esophagus has a lower incidence than other gastrointestinal tract cancer; however, there are many difficult issued related to the choice of appropriate therapy for these patients. In recent years, the use of multimodal treatment has greatly improved the prognosis of patients affected by this disease but several aspects of the oncological and surgical management are still controversial. 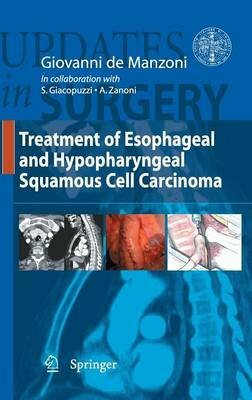 This book aims to give a homogeneous approach to esophageal cancer treatment, based on the author's lifetime experience in conjunction with exhaustive review of recent literature. In each chapter surgeons and oncologists will find appropriate tools for correct management of the diagnosis and therapy of this difficult disease. The book analyzes all the aspects of staging and treatment, such as modern diagnostic and staging techniques (MRI or PET-CT), endoscopic treatment of early cancer, new minimally invasive and open surgical techniques, and combined treatment. In addition, there are chapters dedicated to the postoperative course of these patients, as well as their quality of life, with indications for the correct follow-up and treatment of relapses.